This is a prose poem to Nantes, drawn from its author’s deep and time-fractured subjective engagement with the city, in tension with the impact of its being for so long “partially hidden” from him: “[A] city which remains for such a long time almost ‘off limits’ eventually becomes the very symbol of freedom”. 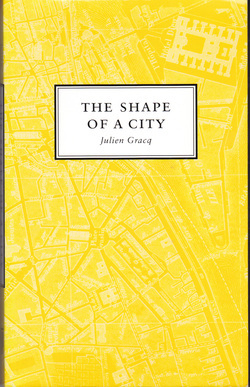 Julien Gracq’s book is packed with exemplary and provocative passages for anyone interested in the psychogeography of cities and is a mental map of a certain kind of textural and exploratory wandering, drawn to “the central chambers of a labyrinth that attracts... like a magnet”. In its focus upon the centre and the ‘inner’, the book provides an enthralling countering of, and complement to, the present-day attraction to the margins, borders and urban edgelands. This is a city where “the unpredictable lies in ambush”, where a certain distance allows a walker to reshape the city’s landmarks “to fit the contours of....secret dreams, breath[ing] life into it according to the laws of desire rather than those of objectivity”. Throughout the book the beat from a surreal layer thumps like a heartbeat, but from within the real rather than above it. This gives a certain continuity to Gracq’s art of memory, so he can carry these dream/landscapes “like some vade-mecum one carries around everywhere to carelessly leaf through, annotate, and erase, a familiar repertory always available for quick consultations”. Gracq reads de Chirico onto bourgeois homes; in the arrival of freight trains he perceives for the first time a larger world of “violence, haste and devilish jubilation” and he imagines “vegetal Noah’s arks” exploding and reseeding abandoned cities; “the postman Cheval’s wheelbarrow standing alone, left to its dreams”. He is sensitized to “all kinds of boundaries along which the urban fabric tends to fray”, to the alignments of Carnac in a road bordered by kerbstones and the wilderness of the suburbs amputated from every major road, where “the concept of a city is fading away”. Onto Nantes’ wasteland Gracq transplants Poe, in the red light district he glancingly intuits “a zone of high tension electrified by its opposite poles” and celebrates the absence in Nantes of those iconic buildings that “can render a town classified as a ‘city of the arts’ almost lifeless for the visitor”. There is an intense attention to detail, a preference for “the odor, patina and texture of a city’s surfaces to the architectural jewels which are her pride and joy”. Instead of monuments, Gracq memorializes the city with “places where I like to be, either physically or mentally”, and celebrates its lack of connections to its rural origins: “camped like a stranger in her own territory, without the least care about how to get along with it”. While there are moments when Gracq’s flânerie passes from abstraction into disconnection, and he rather over-celebrates his refusal to put his feet in others’ shoes, there is so much here, from techniques of sensitivity to theories of ambience, for any explorer to enjoy.